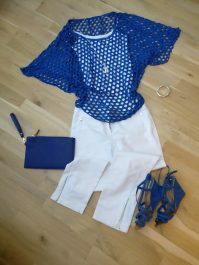 Capsule holiday wardrobe made easy! Packing to go on holiday can be tiresome – often times you end up over-packing and bringing most of it back unworn! 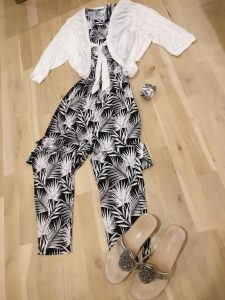 – but taking a capsule wardrobe makes it easy! 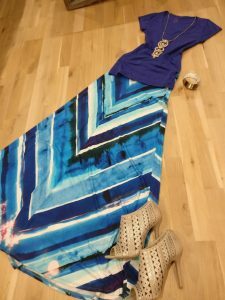 Check out the Style Mojo video below for a quick walk through what to do and then read on for more tips and advice plus pictures of the outfits that I can make from just 29 items (the 23 in the video plus shorts, swimwear and basic t-shirts or cami’s). It would be enough to last for 4 weeks plus no problems! This capsule assumes that you are going on a beach holiday, but you can follow exactly the same principles to create a capsule that will work for wherever you are going and what you are likely to be doing. It just takes a bit of forethought and planning to decide the types of items you need to be packing. 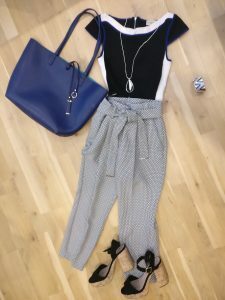 It’s obviously hugely helpful to know which colours and styles of clothes suit you and express your personality too, so that you can build a capsule wardrobe full of clothes that you feel absolutely fabulous in. (If you need any help with either aspect I’d love to help you: full image consultations, colour consultations, style consultations). 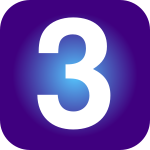 One of the easiest ways to create a holiday capsule wardrobe is to think of everything in 3s. So choose just 3 colours from your palette for your capsule that can mix and match together, and then choose 3 of each type of item in one or more colours or in a pattern with mixes of those colours – 3 skirts, 3 pairs of trousers, 3 dresses, 3 casual tops, 3 smarter tops, 3 cardigans, and for a beach holiday 3 pairs of shorts (click here to read my blog on choosing shorts for your shape), 3 items of swimwear (click here for advice on the most flattering swimwear for your shape) and maybe 2-3 beach cover-ups. The secret here is simply to wear the heaviest things so that they don’t create extra weight and bulk in your luggage. Travelling in jeans is good, for example – so long as they’re comfy and you don’t think you’ll feel too hot when you arrive at your destination. For a beach holiday you’ll likely only need one jacket, so wear that too. To keep things simple, choose a beach bag that you can fit another bag inside. The large colbalt blue one in the video and photos below came with a turquoise inner bag. I simply swapped it for a metallic one to use for the evenings. I then carry the blue bag, complete with the gold one inside, for travelling. lovely with the 2 cover-ups pictured here, plus I use the holey blue top as a cover-up too. 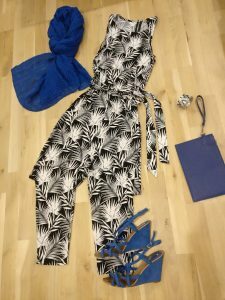 There are 23 different day/evening outfits, without counting the shorts combinations or the days when you will simply wear your swimwear with a cover-up! And these are not the only outfit combinations by any means. You could simply wear a basic t-shirt/cami or a bikini top with any of the skirts for example. 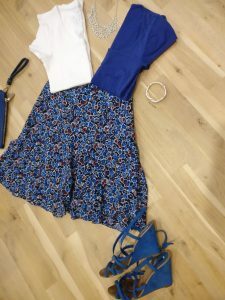 I in fact took pictures of similar outfits that I had simply accessorised with different jewellery, shoes and bags too which would add to the number of outfits you can create, but there were so many here that I thought it was enough of my poor photography to inflict on you! 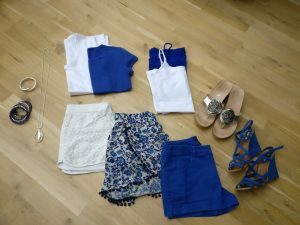 I hope that you can see just how easy choosing what to wear becomes when you create a capsule wardrobe – getting dressed each morning becomes a pleasure, leaving you to get on with enjoying that much deserved holiday! 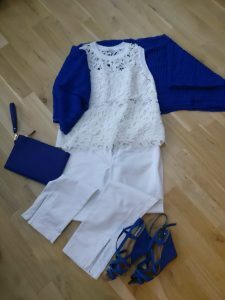 If you’d like help pulling together a capsule wardrobe – whether that’s for work, home or holidays – just get in contact. I’d really love to help you. 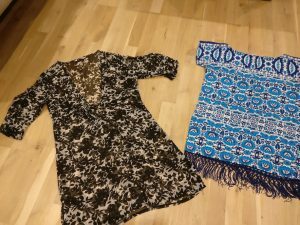 I charge £60 per hour for my time, so for an investment of about £120 those headaches caused by not knowing what to choose to wear each morning could become a thing of the past!